Gangtok: Prime Minister Narendra Modi on Sunday, arrived in Gangtok for a two-day visit to Sikkim during which he will inaugurate the state's only airport-the Pakyong Greenfield on Monday. 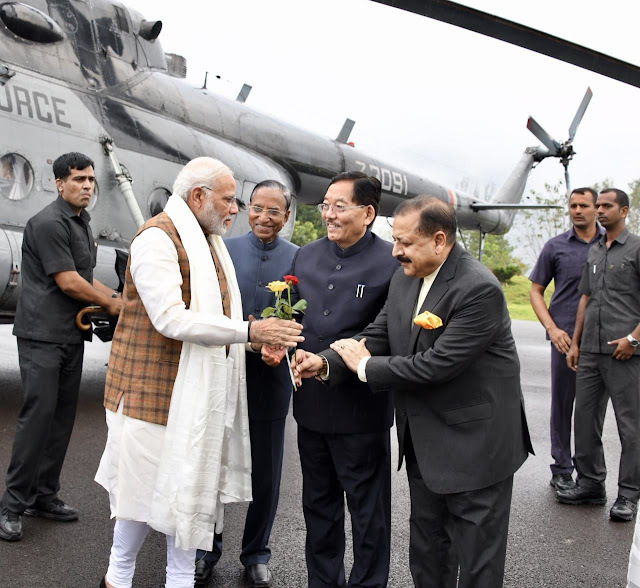 The prime minister was received by Governor Ganga Prasad, Chief Minister Pawan Chamling and others at Libing Army Helipad. From the Army helipad, the prime minister's entourage travelled around to the Raj Bhawan where he will stay for the night. A large number of people carrying colourful flags gathered to get a glimpse of the prime minister. Later at Raj Bhawan, the prime minister met BJP leaders and representatives of various social organisations. PM Modi will also address people at the St Xavier's School at Pakyong after the inauguration.